Posted November 28, 2013 by admin & filed under City Hub. 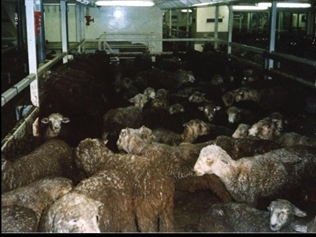 Tens of thousands of Australian sheep and cattle shipped to the Middle East to be slaughtered for food die during the journey each year due to starvation, heat exhaustion and cramped conditions. This was the message conveyed in an exhibit consisting of a rowboat crammed with hundreds of stuffed animals by PETA, the animal rights group, last week at Martin Place. “Australian animals die by the tens of thousands each year when they are crowded together on multi-tiered, open-decked ships for voyages across thousands of kilometres of sea – in 2012, reported mortalities were in excess of 20,000,” said PETA Australia campaign co-ordinator Claire Fryer. “We hope that people may be able to relate to the fate of animals used in live export and imagine what life could be like for even a single sheep crammed onto a multi-tiered ship, scared, injured and unable to get the help she so desperately needs. The Martin Place exhibit was launched in reaction to Sydney Ferries’ decision to ban a recent PETA advertisement which depicted sheep packed into a filthy stall on a ship. A spokesperson for Transport for NSW told City Hub that offensive or contentious advertising was not allowed. “Under the contract between Transport for NSW and Harbour City Ferries, the operator must not advertise or permit advertising ‘political, religious or other subject matter which is contentious or offensive’,” the spokesperson said. Ms Fryer explained that the advertisement was designed to show the realities of live export. “There are many violent ads which the public are regularly exposed to – we simply wanted to show the realities of the live export journey,” she said. Investigations revealed that animals who survive the journey to the Middle East are dragged by the ears and legs onto trucks, kicked in the face and hauled to backyard slaughterhouses, where their throats are cut while still conscious. Ms Fryer explained that such treatment went unchecked in these countries because they lack the laws that Australia has in place to protect the animals.